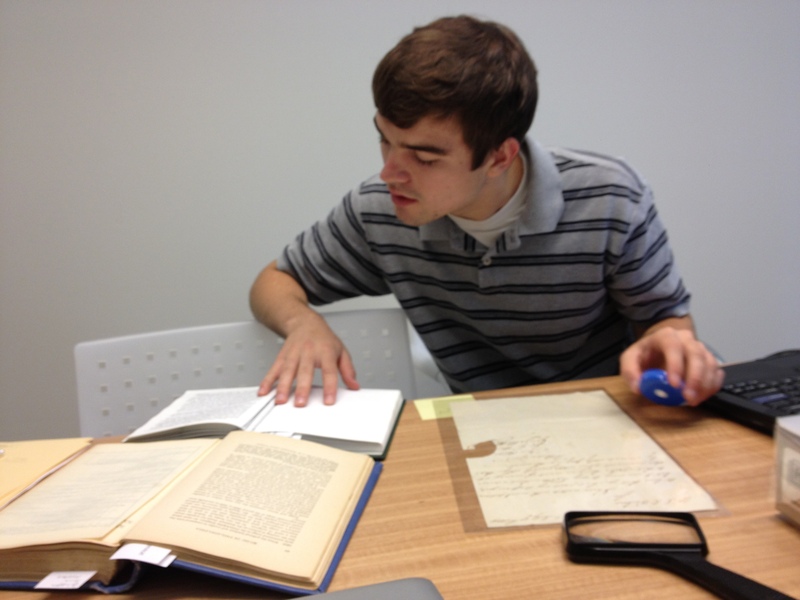 Sophomore John Baranik takes a break from his busy schedule on a weekday to talk to me about a new group called the Penn Manuscript Collective. The Collective was formed by Professor Peter Stallybrass in the Fall semester of 2012 while he was teaching the Freshman Seminar, The Bible as Literature. The class took a hands-on approach, examining medieval and early modern Bibles in the Special Collections Center and students were turning in exciting papers based on original research with primary documents. John was a freshman in this class in his first semester at Penn. He got the book history bug in the seminar and in the Spring he took another class with Stallybrass and Roger Chartier, a regular visitor to Penn from the Collège de France in Paris: Topics in History of the Book: Printing, Writing and Reading in Early Modern Europe. 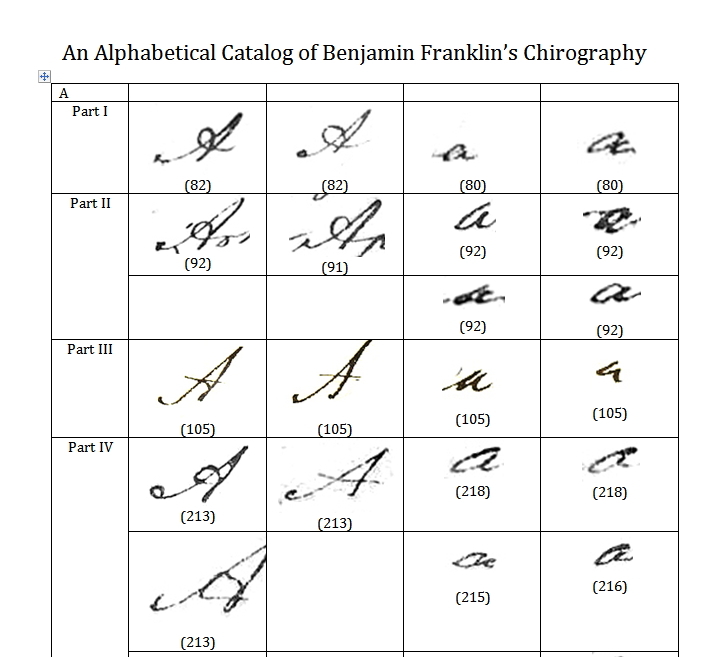 He describes the sample alphabet he and undergraduate Ben Notkin created using cropped images of each letter of the alphabet found in the manuscript of the Autobiography of Benjamin Franklin. They analyzed the text using the online digital copy provided by the Huntington Library, where the original is housed. They wanted to determine if Franklin himself was making these corrections, and for what purpose, so they used the alphabet to examine the hand used to make corrections to the text. It turns out that Franklin was most likely making the corrections himself and they were mainly for stylistic purposes, and not self-censorship. It was a success like this that sparked the idea for the Collective. Stallybrass wanted to ensure that the time-intensive research his students were doing would continue to be of use in the future, for full-text searching capabilities, scholarly digital editions, and other imaginings. So the Penn Manuscript Collective was formed to create a platform for the crowdsourcing of transcriptions of manuscripts in the Penn Libraries’ collections. Both undergraduates and graduate students can participate by examining documents that are of scholarly interest to them and creating their own transcriptions. Stallybrass is searching for the right digital transcription tool to use for the project, one that will allow students to focus line-by-line on digitized texts of their choosing as well as to collaborate on shared projects. There are a number of free open-source transcription tools available right now that could work for the Collective. T-Pen, which is often used to transcribe medieval and renaissance manuscripts, uses image mapping to create a grid on each page image divided by the visible columns and lines on the page. The transcriber can enter a line transcription into the box available below the line, as well as make notes about their editorial choices. There are links to the Latin Vulgate, a Latin dictionary and an index of common abbreviations. A new experimental feature available is glyph matching between manuscripts that are in T-Pen’s image cache. Other options include Scripto, FromThePage, and WikiBooks. Of these options, Scripto will probably be the choice for the Penn Manuscript Collective. The Penn Libraries are going to begin supporting Omeka for library-related digital projects and Scripto works as a plug-in to Omeka or WordPress. Scripto uses MediaWiki as the content management system. 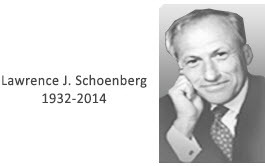 The program itself allows a side- by-side comparison of the image and the transcription and the ability to look at all drafts too. While it lacks some of the nice features of T-Pen, it has some advantages. It can be installed quickly, it’s easy to use, and it makes more sense for a project with a broad scope of materials like this one. Check out this demo in Sandbox to try out Scripto nested in Omeka: http://scripto.org/omeka/. Stallybrass and his students are already organizing a Penn Manuscript Collective conference. They are meeting on January 31 at 4:00PM for participants to share their research and experiences. If you are an undergraduate or graduate student interested in participating in the Penn Manuscript Collective, email John Baranik at pennmanuscriptcollective@gmail.com.